As some of you may already know, I'm not a fan of writer/director Terrence Malick. I guess you can identify me as someone who appreciates his work but, like so many other revered filmmakers and movies, I can do without it. 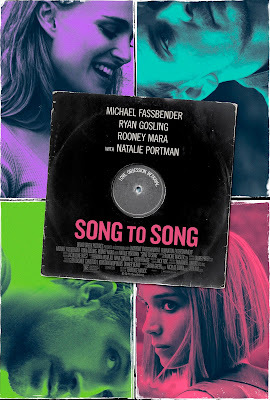 So, I can't say I'm all that excited to see the trailer for his latest film, premiering at SXSW, SONG TO SONG, though it does star three of my favorite actors Natalie Portman, Michael Fassbender, Ryan Gosling, and Rooney Mara. (I'm still warming up to Mara). I just hope it doesn't turn into a beautiful nap, like The Tree of Life or Knight of Cups. Also, is it just me or has Gosling just become....unremarkable in films lately? I know I know, he's just been nominated for an Academy Award for La La Land (don't even get me started on that movie again), but I long for the Blue Valentine or Half Nelson Gosling, the one who could rip my heart out then make me angry by the next scene. He was effective, and now I feel like he's become...wallpaper. And SONG TO SONG looks on par with that. Gosling, please come back. End semi-rant. I'm trying to be cautiously optimistic, really I am. SONG TO SONG opens in theaters in Los Angeles and New York on March 17. Thoughts?